This is the only place I'll bring my BMW for repairs! The work get's done quickly and the prices are great. Lou and his guys are so honest and reliable. Thank you for another job well done! Great bunch of guys -- really know what they are doing. Very skilled and knowledgeable in servicing European cars! I would highly recommend Tony & Bros. Took my BMW in and hands down, Lou and Alex's service was top notch. They were honest, caring and went above and beyond working with my extended warranty company to ensure my car was repaired to spec. Lou and Alex are great to deal with. Honest and passionate about their craft. Thank you for fitting in the pre-purchase inspection on the A7 I am considering on such short notice! It was difficult to find a time with the car's owner and your willingness to accommodate on short notice was simply fantastic. I will be seeing you in the future for service on my purchase. They took the effort and time to ensure I knew what the issues were and how and why it occurs which in my case was carbon build up and a failing thermostat. The work was completed on time and on an established budget. Great work guys! Excellent service. They know their German cars! Took my Mercedes for its first A service. I was very impressed by their knowledge of the car, attention to detail and professionalism. Lou took his time to examine the car thoroughly and only performed the service that was needed. The price was also very reasonable. I feel bad that I did not know about them earlier. Absolute exceptional service. Lou and Alex are the best. They’re extremely knowledgeable and honest. I trust them implicitly with our cars, BMW & Porsche. Great service. Honest, Prompt, and Great Quality. What else can you ask for? A refreshing experience for a 1st time BMW owner. They diagnosed the problem and addressed the problem - and only the problem. No annoying up-selling. Thank you fellas. Great work! Lou and Alex at Tony & Bros are officially my new mechanics for my 2010 BMW 335i! If you own a 335i you have or will soon have some sort of mechanical failure, but rest assured, Tony and Alex can fix it the first time and for a more reasonable price than the BMW dealerships. They are honest and professional! Very solid and fast work on my son's BMW. Lots of valuable advice as well. Can highly recommend this shop to bring your German car to! Awesome customer service. Always reasonably priced repairs! Went in for a water pump change on my 2010 VW Tiguan . Alex was really amazing . Not only these guys are real Professionals , but Alex's ton of patience and explanation of each and every small details made me really comfortable -- Their pricing is worth their service standards - Hard to find such people in automobile industry - Keep it up guys !! This is the 2nd time I have had my BMW repaired at Tony & Brothers and both times the service has been great. I appreciate Lou and Alex for their honesty, integrity and quality of service. I will continue being a customer. Excellent service with fair pricing. Alex and Lou are very trustworthy and personable. I have been servicing my 2004 Anniversary Edition Porsche Boxster S for several years and have added a 2013 Audi S4 after my prepaid Dealer Service Contract ended. They are very knowledgeable, won’t gouge you, and won’t suggest anything unnecessary. You won’t be disappointed. Knowledgeable and friendly staff- brought my Golf R in for a 30k service and they got it done on time! 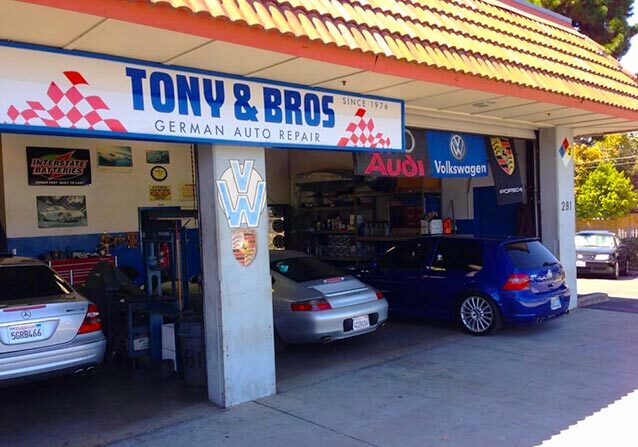 We invite you to stop by and visit Silicon Valley's #1 German Auto Repair, Service & Maintenance facility! Opened in 1976 as a family-owned and operated business in Sunnyvale, CA, we are conveniently located off Central Expressway & Fair Oaks for easy access from any location in San Jose, Santa Clara, Mountain View, Palo Alto, Cupertino and Los Altos. We have extensive experience and specialize in the maintenance and repair of most Audi, BMW, Land Rover, Mercedes Benz, Mini Cooper, Porsche, Volkswagen and Volvo vehicles while providing you with highest level of customer service. With over 45 years of experience and thousands of German and European automobile repairs, scheduled services / intervals and performance upgrades under our belts, we leverage our rich experience with our factory-trained knowledge, to provide our customers with the best repair & service work possible. Need an estimate? We're always happy to provide free estimates to those who make an appointment online or call us. Our business hours are Monday - Friday 7:30am - 5:00pm. For those who simply wish to stop by the shop to get an estimate, feel free and we'll do our best to get you an estimate within minutes. Too busy to stop by? Simply complete our drop-off form, leave your car with us after hours, and we'll get back to you the next morning with a free estimate. German automobiles are high-precision cars requiring constant attention and love, and nothing is more critical to maintaining a well-tuned machine, than to properly maintain it with regular scheduled factory service and maintenance. We are a high-tech, fully-equipped maintenance and service facility in the heart of Sunnyvale. Located off Central Expressway and N Fair Oaks Ave., we have over 3000 square feet, four lifts and three technicians dedicated to serving your automobile. Plus, we are prepared to quickly and accurately diagnose and repair any problems occurring with your car.